The tahini layer is made with only 3 ingredients. It begins with melting 20 oz. (1 1/4 lb) of vanilla almond bark. You can find this at the grocery store, usually next to the chocolate chips. Stir in a can of sweetened condensed milk and 2/3 cup of tahini - that's it for layer #1! If you've never used tahini, opening a can to find a layer of oil on top of a solid layer of sesame paste can look quite odd. The two layers will need to be stirred together thoroughly before use. It's kind of a pain to stir by hand, so I recommend pouring the oil and scraping the paste into the bowl of a stand mixer. Paddle it on low speed until smooth. The chocolate layer is made with only two ingredients! Again, one can of sweetened condensed milk does the trick when heated with a 12 ounce bag of semisweet chips. 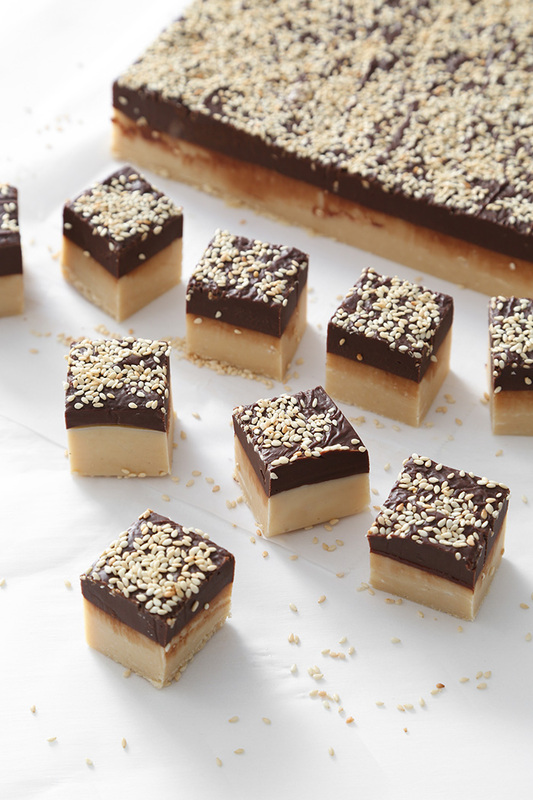 Pour the chocolate layer over the firm tahini layer and garnish with toasted sesame seeds. After a quick chill in the fridge, cut into pieces. I packaged pieces in little buffalo plaid snack bowls with lids. 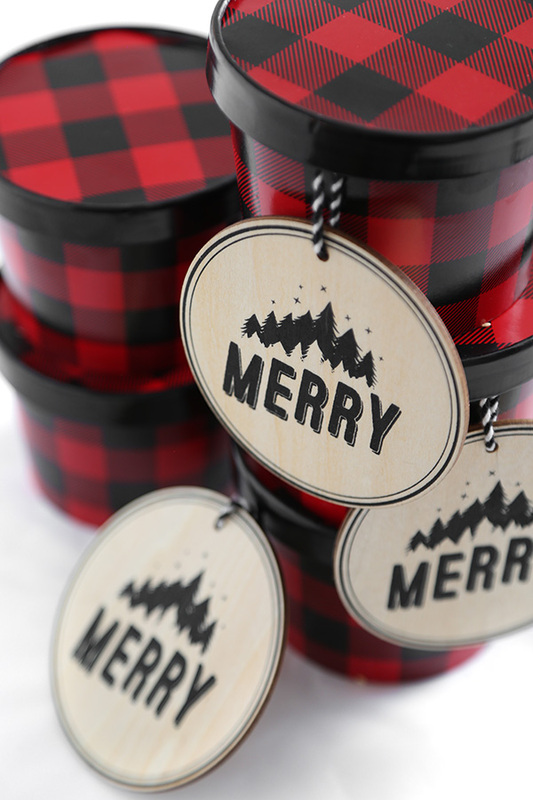 The woodsy wooden gift tags are big and bold, with lots of room for penning 'TO' and 'FROM' on the back. 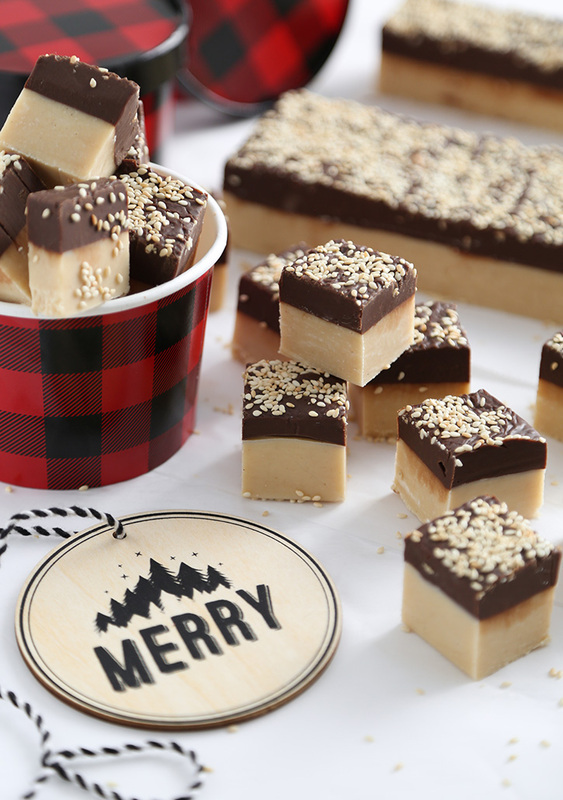 I absolutely love giving candy at Christmastime, and I can't wait to gift this fudge to friends and neighbors. It's delightfully different, and perfect for the food lover on your list! Be sure to use sweetened condensed milk in this recipe, and not evaporated milk. Condensed milk is sweet, thick and syrupy. Stir tahini well before using in this recipe. Grease an 8x8 square baking pan with shortening and line with parchment paper that overhangs all four edges. For the tahini layer: Break the almond bark into pieces and place in a saucepan. Melt over low heat on the stove top until smooth. Stir in the condensed milk and tahini. Mix until well incorporated. The mixture will thicken so work quickly! Spread the mixture in the bottom of the prepared pan and refrigerate until set, about 1 hour. 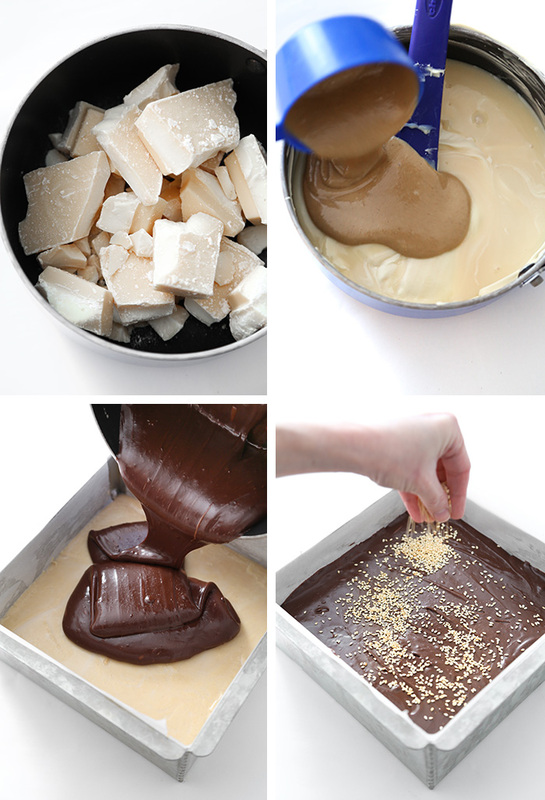 For the chocolate layer: Combine the semisweet chips and milk in a saucepan and place over low heat. Stir until melted and thoroughly combined. Pour over the tahini layer and immediately top with toasted sesame seed. Refrigerate until firm, about 1 hour. Cut into 32 one-inch squares. 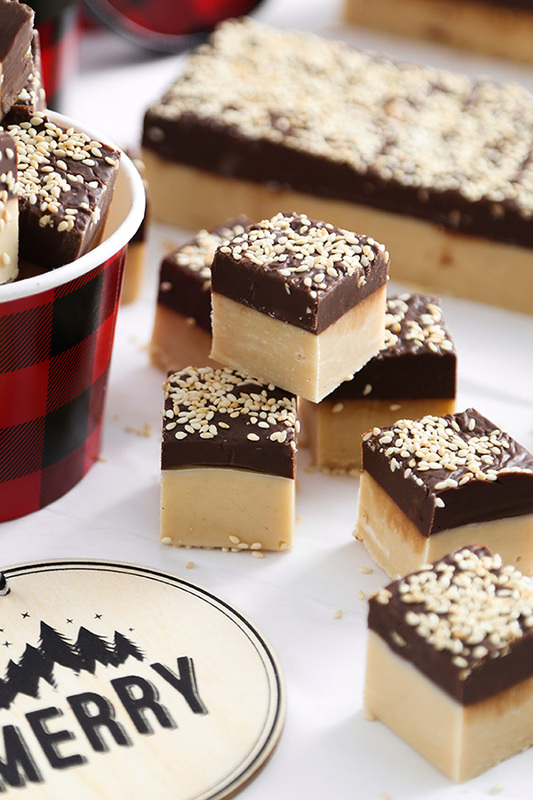 Allow fudge to come to room temperature before serving. Package pieces in lidded containers for holiday gift giving. **To toast sesame seed: place sesame seed in a nonstick skillet and turn to medium-high heat. Stir constantly until golden brown; transfer to a plate to cool. Is it OK to substitute white chocolate for the almond bark? Yes! White chocolate chips will be best because they firm better than callets or bars. I tried using callets recently and because of their high fat content the fudge was almost too soft.